All of our chain slings are made out of the highest quality parts and assembled by certified riggers. Each chain sling is pull tested after assembly to ensure a that the sling is assembled correctly and we provide the pull test certs with all chain slings. 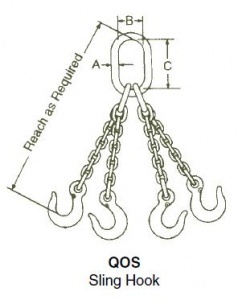 Each chain sling has a product code which refers to the parts that are used on the chain sling assembly. Do not exceed Working Load Limits (WLL)! Failure to read, understand and follow the CAUTIONS listed here may cause serious physical injury and property damage. Do Not load an assembly in excess of working load limits shown. Do Not put an unequal load on one leg of a sling. Distribute the load evenly. Do Not expose assembly to impact, rapid lifts or sudden stops. Do Not tie knots or allow chains to become twisted. Do Not use a chain that appears to be defective, worn or damaged. Do Not fasten chain over sharp corners or edges. Protect with padding. Do Not tip load hooks. The latch must never support the load. When using non-cradle or non-shortening grab hooks in a shortening or choker application, the Working Load Limit (WLL) of the sling must be reduced by 20%. Please reference our Cautions & Warnings section for more information.